South Toward Home: Adventures and Misadventures in My Native Land (Hardcover) | novel. In considering the pleasures and absurdities of her native culture, Julia Reed quotes another Southern writer, Willie Morris, who said, “It’s the juxtapositions that get you down here.” These juxtapositions are, for Julia, the soul of the South, and in her warmhearted and funny new book, South Toward Home, she chronicles her adventures through the highs and the lows of Southern life—taking us everywhere from dive bars and the Delta Hot Tamale Festival to an impromptu shindig on a Mississippi River sandbar and a coveted seat on a Mardi Gras float. She writes about the region’s music and food, its pesky critters and prodigious drinking habits, its inhabitants’ penchant for making their own fun—and, crucially, their gift for laughing at themselves. 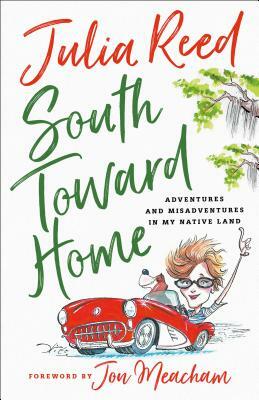 With her distinctive voice and knowing eye, Julia also provides her take on the South’s more embarrassing characteristics from the politics of lust and the persistence of dry counties to the “seemingly bottomless propensity for committing a whole lot of craziness in the name of the Lord.” No matter what, she writes, “My fellow Southerners have brought me the greatest joy—on the page, over the airwaves, around the dinner table, at the bar or, hell, in the checkout line.” South Toward Home, with a foreword by Jon Meacham, is Julia Reed’s valentine to the place she knows and loves best. JULIA REED is a contributing editor at Garden & Gun, where she writes the magazine's "The High & the Low" column. Her books include But Mama Always Puts Vodka in Her Sangria; Ham Biscuits, Hostess Gowns, and Other Southern Specialties; and Queen of the Turtle Derby and Other Southern Phenomena. Reed divides her time between New Orleans and Greenville, Mississippi.